Adams Carpet Care offers carpet cleaning in Durham, NC. Since 1985, we have offered residential and commercial customers in Durham with the best in carpet, area & oriental rug, upholstery and tile & grout cleaning. We start our service with a free estimate, during which we will evaluate your cleaning needs and provide you with a quote. Our cleaning services are achieved by a truck mounted steam extraction service that is environmentally friendly, safe for kids & pets and effective. We offer a 30 day warranty on our work, if the spots come back in 30 days, so will we, free of charge! 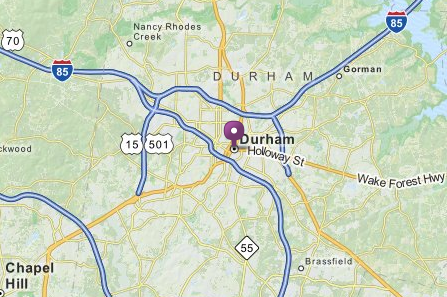 Durham residents and businesses are proud to call the “City of Medicine” or “Bull City” home; it is an area rich in history and alive with new commerce and growth. Adams Carpet Care proudly serves the Durham zip codes of 27704, 27503, 27712, 27705, 27701, 27707, 27709, 27560, 27703, 27713 and 27517. This includes areas west of Chapel Hill, Falconbridge, Southpoint, Research Triangle, Downtown Durham including American Tobacco, Duke Forest, Duke University, Forest Hills, North Durham and more.